Ayumi Horie is a full-time studio potter from Portland, Maine who makes functional pots, mainly with drawings of animals. 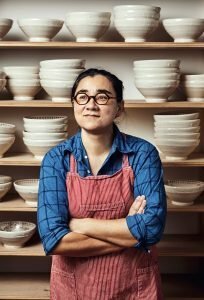 In 2015, she awarded a Distinguished Fellow grant in Craft by the United States Artists and is the first recipient of Ceramics Monthly’s Ceramic Artist of the Year award. She has taught workshops and given lectures at many universities, art centers and residencies in the U.S. and abroad, including the Archie Bray Foundation, Haystack Mountain School of Crafts, Greenwich House Pottery, Penland School of Crafts, Peter’s Valley, Arrowmont School of Arts and Crafts, the Northern Clay Center, and the International Ceramic Research Center in Denmark. She served on the board of directors at the Archie Bray Foundation for nine years, where she was a resident for two years between 1996 and 1998. Currently, Ayumi is now on the board of the American Craft Council and Haystack Mountain School of Crafts. Her work is in various collections throughout the US, including the Museum of Art and Design in New York City. Currently, she is working on The Democratic Cup, a fundraising campaign for progressive causes through the sale of limited-edition handmade cups designed by a passionate team of renowned illustrators and potters. Icons, heroes, and conversation-starters like Ruth Bader Ginsburg, bell hooks, Sojourner Truth, and Bernie Sanders adorn each cup. The mission of The Democratic Cup is to support and promote civic engagement. A democratic and familiar, the coffee cup, is the perfect object to act as a catalyst for social change and true dialogue. Her collaborative public art project, Portland Brick, just finished up this summer in Portland, Maine and she runs an ongoing Instagram feed called Pots In Action, which features ceramic art from all over the world. In the fall of 2008, Ayumi curated and organized Obamaware, a fundraiser involving the work of 27 nationally known ceramic artists who made Obama-themed work specifically for the event. Put together in five short weeks, the three day auction held at the end of October, just before the election, raised $10,843.54 for the Obama/Biden campaign. In 2011, just after the Great East Japan earthquake, she co-founded Handmade For Japan which to date has raised over $100,000 for disaster relief in Japan. Ayumi received her B.A. from Mount Holyoke College, her B.F.A. in ceramics from the New York State College of Ceramics at Alfred University, and her M.F.A. in ceramics from the University of Washington. Ayumi Horie grew up in the 1970’s in Lewiston/Auburn, Maine, an old mill town where huge brick factories lined the river. She learned to love working with her hands early on as her Japanese family fished, gardened, cooked, and often visited the beach. She learned about the materiality of the world through explorations in both the woods and in old attics where antiques were piled high. Her hand-eye coordination developed through many hours spent playing ball games, mini-golf, and Atari. The refrigerator was always crammed full of food and the table laid with dozens of Corningware dishes loaded with everything from sushi to apple pie. With a childhood like this, it’s only natural that Ayumi grew up to become a potter. As a side interest, she started a Facebook group called the International Society of Woodstack Enthusiasts and if want to know how to pronounce her name, just ask her father.